Jenica strong with the Thrusters. Update on the Open: Week 1 and Update on the Open: The Launch of the Games Site. "We shall never have more time. We have, and have always had, all the time there is. No object is served in waiting until next week or even until to-morrow. Keep going day in and out. Concentrate on something useful. Having decided to achieve a task, achieve it at all costs." Rob Orlando 245lbs, Brandon Pastorek 110kg. Post loads to comments. CrossFit Competition to be held at the UFC Fan Expo, April 29-30, Toronto, ON. "All Hail the Hypotenuse", The Wall Street Journal. Russell Berger 5:50, Kim Malz 12:31. Post time to comments. CrossFit Level 1 Certificate Courses: Fightercentre Stockholm/CrossFit STHLM, CrossFit Brisbane, CrossFit Las Vegas, CrossFit Marina, Iron Major CrossFit, CrossFit Atlanta. CrossFit Coaches Prep Course: CrossFit Santa Clara. "Sports Business: The Brains Behind BeachBody's P90X" by Darren Dahl, Open Forum. Geronimo Hill, Fort Sill, Oklahoma. "It is a favorite belief of mine that no student ever attains very eminent success by simply doing what is required of him; it is the amount and excellence of what is over and above the required, that determines the greatness of ultimate distinction." Juan and Val having a great day at BU CrossFit. Johannes Brahms, Horn Trio op. 40 finale. "The Messy Path to Creating Jobs" by Carl J. Schramm, Forbes. Laura Cziak at the NoVa Open. "Raw Strength" by Andrea Maria Cecil, CrossFit Journal. "Never use a large word when a diminutive one will suffice." 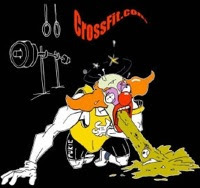 Chris Spealler 4:47. Post time to comments. In the overhead squat, the path of the barbell is vertical and remains over the foot while its position relative to the head and angle of the torso can vary. "The most exciting phrase to hear in science, the one that heralds new discoveries, is not 'Eureka!' (I found it!) but 'That's funny..."
Melissa getting after the Ball slams during today's WOD. Russell Berger 3:43, Ben Smith 3:50, Austin Malleolo 4:01, Chad Wittman 4:09, Keegan Martin 4:10 (age 17), Kristan Clever 5:39 (16lb ball), Rebecca Voigt 6:08 (16lb ball). "The Day the Movies Died" by Mark Harris.